When a release evokes a sense of royalty, collectors expect something special. 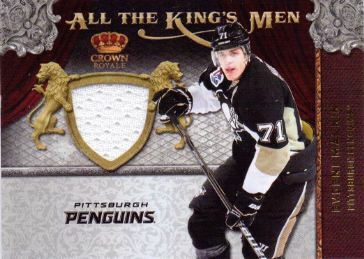 2011-12 Crown Royale aims to reach those lofty expectations with lots of high-end hits, not to mention the distinct die-cut base card design. 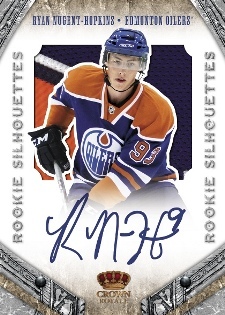 With another solid rookie class emerging, the Rookie Silhouettes are bound to be some of the most attractive rookie cards of the year. Hockey card collectors can also expect lots of premium patch cards. Each four-pack box promises two autographs and two memorabilia cards. An autograph or memorabilia card in every pack. Rookie Silhouettes (20 cards) rookie cards feature a distinct design that has both an on-card autograph and an embedded patch acts as a backdrop to a die-cut player photo. Signature Silhouettes follows a similar approach as their first-year counterparts, only with veteran stars. 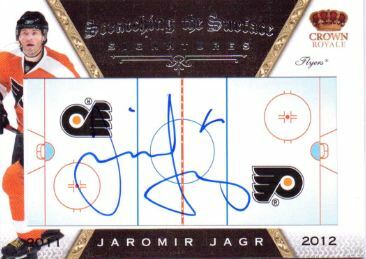 Scratching the Surface Signatures sees autographs placed on ice rink designs. 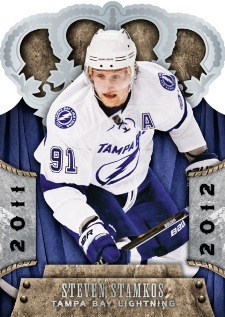 Checklist highlights include Jaromir Jagr, Steve Yzerman, Manon Rheaume, Martin Brodeur and Steve Stamkos. 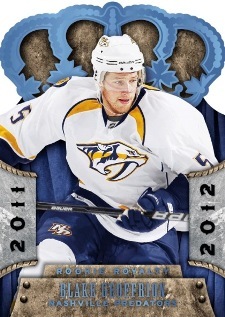 Crown Royale Ice Kings is a legends-focused set that includes on-card autographs and serial numbering to 99. Crown Jewels are a case hit that promises the hobby's hottest players. 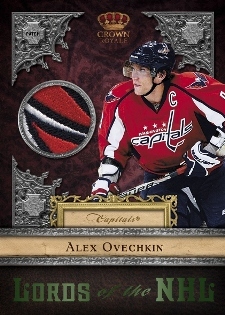 Several basic inserts will have patch parallels, including Mythology, All The King's Men, Heirs To The Throne, Royal Lineage and Lords of the NHL. All patch cards are limited to a maximum of 25 copies. 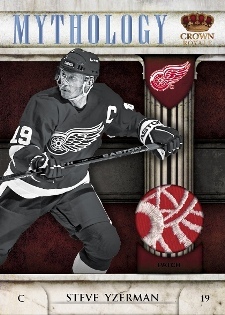 Good: Great mix of veterans, rookies and legends. Does a good job of highlighting the best of the best to deliver a diverse mix of players at all experience levels rather than just focusing on just the rookies or stars. Bad: Collation was an issue as the advertised box break is to deliver two autographed cards and two memorabilia cards. Our box had four hits but only one of them was an autograph. With a base set of 100 cards, the pack-out configuration of only four packs per box and five cards per pack makes completing a set a challenge. The Bottom Line: 2011-12 Crown Royale Hockey is a product that relies on its attractive, albeit over-the-top, design elements to capture the interest of player and team collectors. With one hit per pack, this is a product that delivers at both the pack and box levels, allowing collectors to test the waters before taking the full plunge. 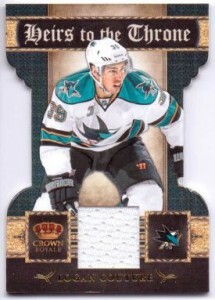 There is little not to like about all aspects of 2011-12 Crown Royale Hockey’s design. 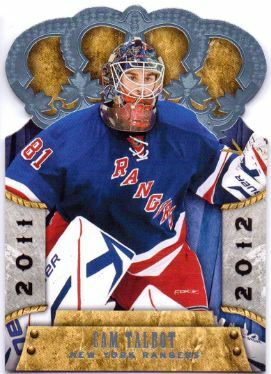 The colorful base cards are regal and accurately reflect the name of the product. The inserts compliment the base set. The autographed and memorabilia cards incorporate the theme without looking like they were built backwards, a knock on numerous Donruss and Panini products through the years. 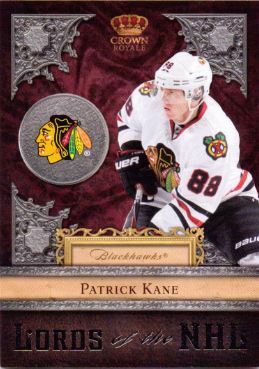 The product does rely too heavily on single-color, often white jersey swatches, which do detract slightly from the dark color scheme of the cards themselves. 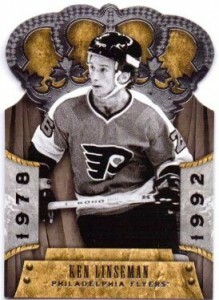 As mentioned, the checklist combines an eclectic mix of stars and short print legends, and rookies. Collectors will need to purchase the product by the case to have a shot at completing a full set of 100 base cards and 40 short prints. While some might argue that this isn’t a set for builders, the checklist is certainly one that hockey card collectors will want to own. 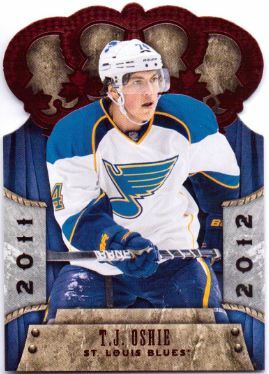 At release, boxes cost about $100, delivering four hits, 2011-12 Crown Royale Hockey offers solid value, but not spectacular. I’d like to see packs include more base cards and additional basic insert cards included in the mix. The fact that we didn’t pull the advertised two autographs also stung. When you are opening a product that delivers one hit per pack, it’s inherently fun. Couple that with the beautiful cards, and the enjoyment is even greater. However, the rating takes a quick dive at the end with only four packs in a box. 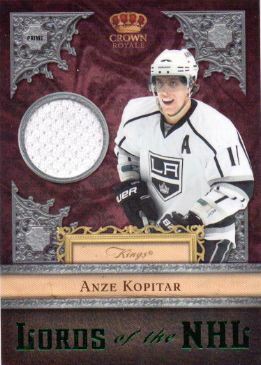 2011-12 Crown Royale Hockey is a product that continues to live up to its name for its unique design and carefully crafted insert checklist. The value needs to be increased to breathe new life into the product and keep it from becoming stale. I opened a factory sealed case of these. The cards were really nice, but my excited really waned when I got to the last box and hadn’t received the case hit. Panini’s customer support is down for the next several days and no one returns calls at any of the other departments. Even if they eventualy replace the missing hit, I won’t have it while the product is hot. The assortment also was not very good. I got THREE of the exact same Cam Atkinson Rookie Card and TWO of the exact same rookie redemption [Paul Postma]. Not sure how to get my money’s worth out of the case without the case hit and having doubles of other hits within a single case. 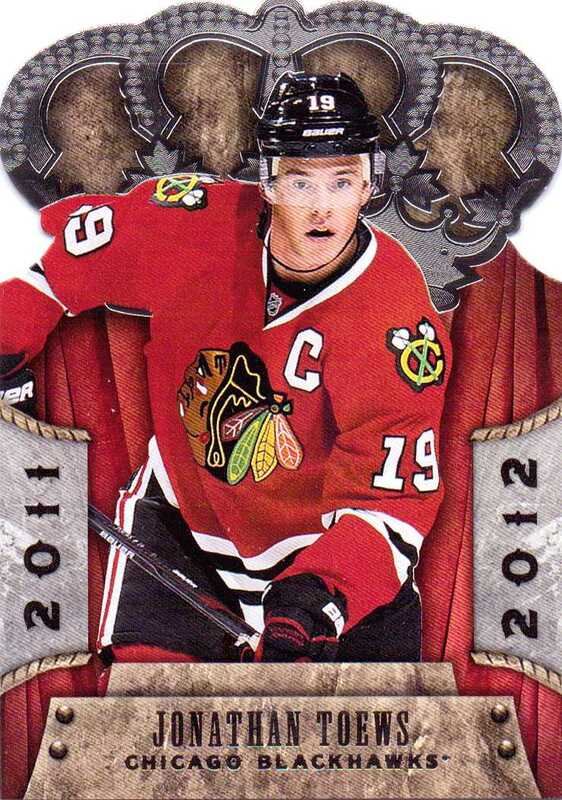 The missing case hit kind of casts a shadow over the cards making it hard to enjoy the other cards. I would not recommend buying this untill after the price drops unless u don’t intend get your money out of it. The triplicate AUs and missing case hit indicate issues with distribution parity. Don’t bother with customer service. You’ll receive a message that they are upgrading their customer support system and no one can get back to you for several days. No one in sales or QA will return phone calls either. Same thing happened to me re: doubles in the same BOX. I bought a case and received 2 Dan LaCostas auto in the same box. Disappointing, considering how many other rookies are available. No excuse for receiving doubles in the same box. I did get the rookie silhouette hit of Brandon Saad. I was shorted one auto from a two boxer! Nice patches though! Too high $$!